Apple has long been tweaking Siri in order to keep the responses relevant and witty, but earlier this week Apple added a dash of self-promotion to the mix. It doesn't happen every time, and the self-referential adverts weren't offered when TUAW asked buying music or videos. 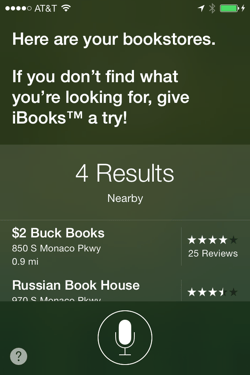 And on a related point, Apple has also refined book-specific queries to be more specific. Queries like "Where can I go to read a book?" no longer generate a useful response. Instead the question needs to be more specific. I've never had an iPhone, but I have always enjoyed reading about Siri's ever changing quirky responses. I've also been putting together a list of quirky questions to ask. For example, if I ever get the chance I plan to tell Siri that I am going to trade her for a dog and shoot the dog. Any idea what the response would be?